Pyle: Identification Guide to North American Birds. Part II: Anatidae to Alcidae. By Peter Pyle with Steve N.G. Howell, Siobhan Ruck, and David F. DeSante. Illustrations by Siobhan Ruck and Steve N.G. Howell. Slate Creek Press, 2008. 836 pp. 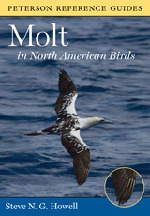 The eagerly anticipated Part II: Anatidae to Alcidae of Peter Pyle's Identification Guide to North American Birds has just been published by Slate Creek Press (2008). This invaluable compendium provides detailed information on identifying, ageing, and sexing waterbirds, diurnal raptors, and gallinaceous birds in the hand. While of primary utility to banders, the wealth of information is of interest to both birdwatchers and ornithologists, whether engaged in bird banding or not. Based heavily on field work and specimen examination, much new information is presented for the first time. 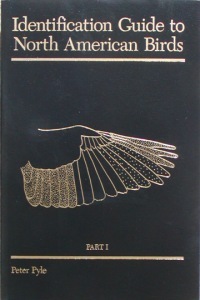 Front material describes and illustrates techniques for identifying, ageing, and sexing birds and 45 pages of Literature Cited round out this robust paperbound volume.